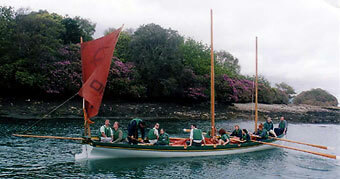 The next O'Sullivan clan gathering will be held on the weekend of 24th to 26 July 2015 in Castletownbere. 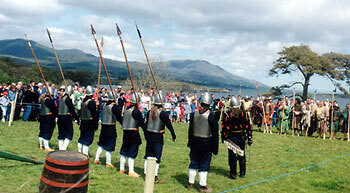 As the Chieftain of the O’Sullivan Clan I wish to welcome you to the official Web-site. 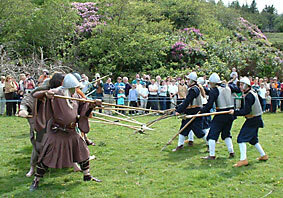 www.osullivanclan.org The Clan is based in Castletownbere on the Beara Peninsula in West Cork – South Kerry the ancestral home of O’Sullivan Beare. 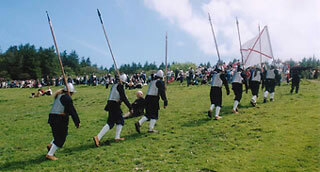 Over the last 20 years we have organised numerous events. 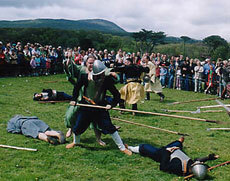 The main event in Dunboy castle will be held on Sunday the 26 of July. This is the ancestral home of O'Sullivan Beare. The clan chieftain Michael O'Sullivan will welcome the visitors and the official opening of the Beara Breifne Way walking trail 600km in length the longest walking trail in Ireland from Beara to Cavan will take place. 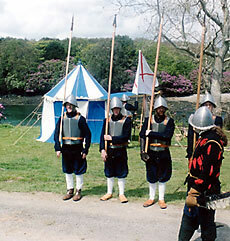 The route is based on the historic March of O'Sullivan Bere in 1603. Naval ships from six countries will anchor off the headland. 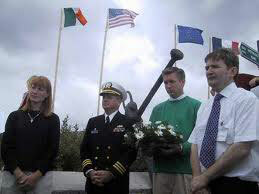 A special invitation will be sent to the USS The Sullivans navy ship of the USA which has historic links with the area. Numerous yachts, pleasure crafts and fishing boats will be invited to participate. Puxley's Mansion will be partly opened on the day with food and drink. 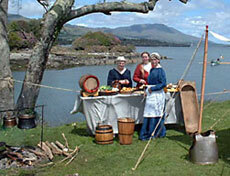 Food will be cooked on a barbecue in the traditional manner. 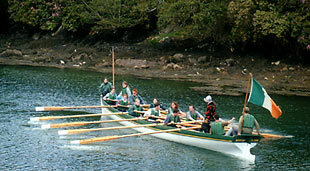 We also hope to do a Guinness World Record with the highest amount of families with 5 brothers or 5 sisters in Dunboy over that week end. 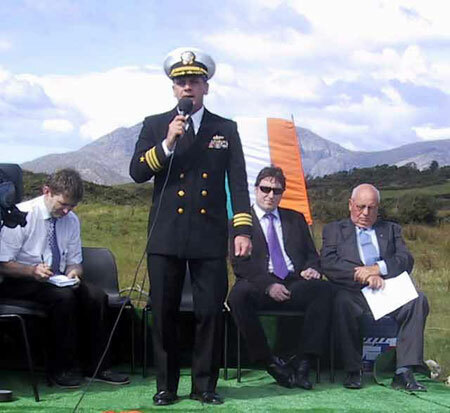 Saturday, 30th August saw a huge crowd gather in Trafrask, Adrigole to commemorate the memory of the 5 heroic Sullivan Brothers who descendants came from Adrigole and who perished on the USS Juneau in 1941 defending the liberty and freedom of their country. Numerous ships and boats lay just off the shore during the ceremony. 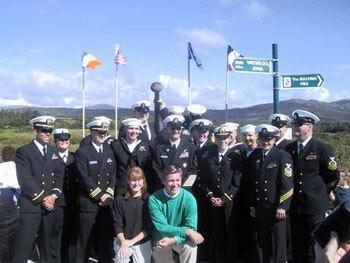 Officers and crew from the USS THE SULLIVANS were present, granddaughter and grandson of one of the1 brothers - Albert, politicians, clergy and people from Beara and further a field. 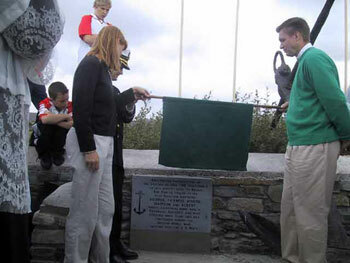 Many many tributes were made to the honour of the 5 Sullivan brothers and the history of how the ship that lay in anchor further up the bay at Lonehart, just off Bere Island came to be in Ireland. There were presentations made to Kelly-Ann Sullivan Loughren and John Sullivan, grandchildren of Albert and they were officially welcomed home. Following the presentations and speeches, Kelly-Ann and John then unveiled the plaque. 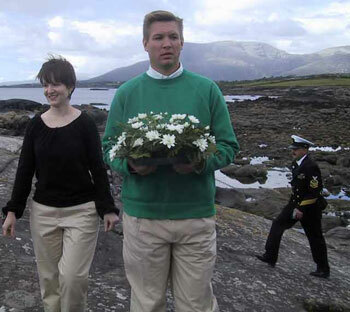 This was blessed and a wreath was then brought by John to the shoreline to the Coast-Guard boat, who then brought it to the Castletownbere Lifeboat, who in turn transferred to the L.E. Orla who went to sea with John to lay it there. The purpose of our Mission this morning is to pay tribute to five brothers who lost their lives in World War Two. Their ancestors were born and raised here, in this parish of Adrigole, in the 1820's. 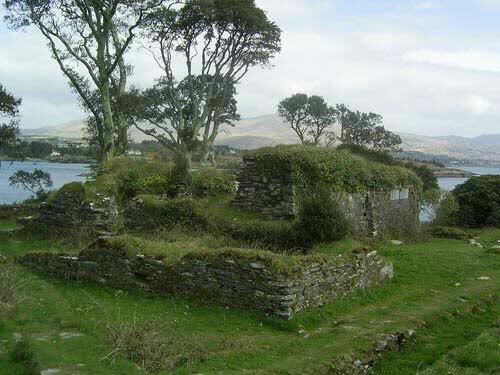 The road from Glengarriff through the Beara Peninsula was constructed in those years; no occupied. houses from that period remain today, although there are many ivy covered ruins to remind us. The years 1845 to 1852 were the Irish Famine years. The autumn of 1845 saw the first appearance of potato blight in this island; but it was not immediately evident that an unprecedented disaster had occurred. During those fateful years many of our courageous antecedents left the tight community of Adrigole, searching for a new life in the shores of America, in a land where everyone was a stranger. It is here that our story starts. Included in this migration were Tom Sullivan, his wife Bridget Agnes, and Tom's brother Owen. In 1849 they left this town land of Trafrask for New York with hope for a new life away from starvation and poverty. After being processed for immigration through Ellis Island, they lived for a time in Oneida in New York State. Later they followed the trail westward, crossing the great Mississippi River and settled in Harpers Ferry, in the new state of Iowa, which was still enjoying its award of statehood in 1846. Tom and Owen Sullivan, were among the first settlers to build farmsteads in or near Harpers Ferry. They must have prospered as they became leaders in their community. Records show that in 1855 they helped to build the Catholic Church of St. Joseph's near their town. Tom and Bridget had five children; the first, Eugene Francis was born in 1852. Eugene, at age 25, married Mary Ann Degan and they had nine children, two girls and seven boys; named Mary Agnes, Bridget, Tom, Michael, John, Joseph, George, William and Patrick Henry. It was the eldest son Tom, who was tile father of the five brothers that we commemorate today. Being an adventurous lad, when Tom was sixteen years old in 1899, he left Harpers Ferry to seek his fortune westward in Montana. 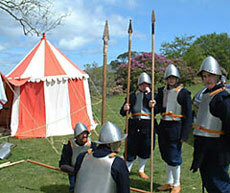 It was also a time of further migration from Ireland. Many mining men left Audum in Beara around that time, attracted by work in the copper mines of Butte Montana. The name of Sullivan or O'Sullivan went with them. Tom Sullivan later moved onto Colorado, where he worked for a period in the Silver Mines. Seeking familiarity he returned to Iowa, settling in Waterloo about 70 miles from Harpers Ferry, where he found work with the Illinois Central Railroad. Waterloo was a typical small American town in the 1920's, its foundations firmly based in rural values. The fast pace of life so common in urban America was unheard of in Waterloo. On February 10 1911, Tom Sullivan married Alleta May Abel, who bore him five sons, the heroic brothers of our story. The eldest of these Sullivan brothers, George Thomas and Francis Henry, known as Frank, joined the American Navy in 1937. George was 27 years old and Frank 25. On December 7th 1941 the Japanese bombed Pearl Harbour. Apparently this event generated a discussion in the Sullivan family house hold. Tradition has it that George said, "Well, 1 guess our minds are made up, aren't they fellows? When we join up we want to go in together. If the worse comes to the worse, why, we'll go down together." Serving with their older brothers in the same ship became a condition of the younger brothers' enlistment. Joe aged 23, Matt aged 22 and Albert aged 19, all joined up with the ranks of Seamen Second Class. This motto of 'We stick together", created by the five brothers, lives today as the motto of the USS The Sullivans. All five brothers were assigned to the New Light Cruiser, "Juneau", the first American Warship commissioned in Camouflage. On Friday, 13th November 1942 , the USS Juneau was struck by a Japanese tornado during the battle of Guadalcanal , near the Solomon Islands in the South Pacific. Four of the five Sullivan brothers went down with the ship. 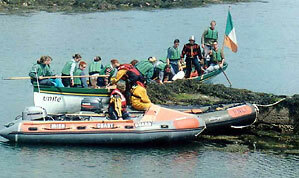 Out of over 700 men, all but 13 of the Juneau's crew perished; many of them were also of Irish descent. Let us remember them today and the sacrifice they made for their adopted country. Of the five brothers, only George, the eldest, is believed to have survived the actual sinking, but he died a few days later in the "Shark Invested Waters" in the South Pacific. The brothers were survived by a sister, Genevieve and the son of the youngest brother Albert. Albert was the only one to marry and his wife Kathleen had presented him with a son, James, in February 1941. In later years James also became a Navy man. In honour of the Sullivan brothers a U.S. Naval Destroyer was named The Sullivans', the first to bear a multiple name in the fleet. The ship was manned by brave men as it earned nine battle stars for action in the Pacific and a further two for action in the Korean War. Tom and Alleta were presented with Purple Hearts on behalf of the U.S. Navy in remembrance of the deaths of their five sons. 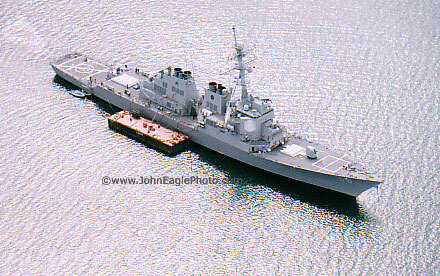 The 376 foot, 2,050 ton destroyer has since been decommissioned and in 1977 was dedicated as part of the Naval and Servicemen's Park, Buffalo, New York State. Albert's son. James Sullivan, his wife Sally and their two children, John and Kelly Ann, were present at this dedication ceremony. Twenty years later, on April 17th 1997, these two children, John Sullivan and Kelly Anne Sullivan Loughren, were present at Stapleton Pier, Staten Island, New York, for the formal commissioning into the Navy of the second USS The Sullivans. Also present was James Sullivan, Chief of the Sullivan Clan here in Beara. 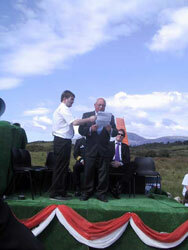 He presented Commander Roncalato with a map of Berehaven Harbour and Bantry Bay, a video of Beara and a map of Ireland. My first introduction to the Sullivans was in 1954 (39 years ago), a film was shown in a local hall entitled "The Sullivans". The film was shot in Northern California where a small town served as the stand in for Waterloo. 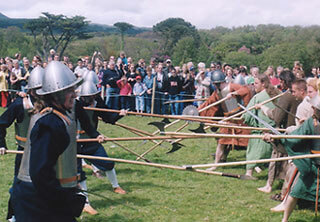 It is said that the late Mark O'Sullivan of Trafrask was related to the original Sullivans who left in 1849. Mark was born near the old Sullivan homestead. His son and daughter are with us today. We also have Mary, the daughter of Morty Sullivan, Mark's brother, and her family. Morty worked at one time at Butte Mountain, Montana; but returned home to Trafrask. After the death of their five sons, Tom and Alleta Sullivan visited St. Patrick's Cathedral in New York, Archbishop Francis Spellman presented them with a Silver Medal and Rosary from the Pope, with the words, "I know of no one else who deserves them more." To day, 154 years after the beginning of our story, we too are creating history.